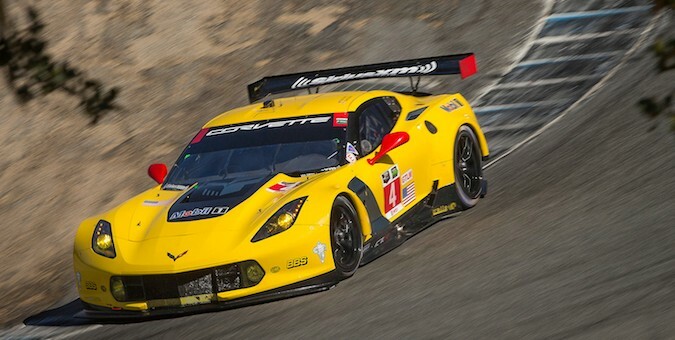 The May 3 race at Laguna Seca was tough for Corvette Racing from the get go. As Magnussen explains, teammate Antonio Garcia had a good start but then got caught up in a group of prototypes and ran into the back of one, damaging the C7.R’s front clip. The team was also running on a new, unfamiliar tire compound that day, so the front wing damage made finding grip even harder. Also making things difficult for Corvette Racing was a mistake in the pits. Magnussen says the “Corvette Racing guys never make a mistake in the pits,” but at Laguna Seca, Garcia went to pit and there was a tire in his way. Magnussen says it’s hard to put blame on anyone, considering there is TV crews and other personnel in and around the pits, but it’s a mistake like this that could squash Corvette Racing’s wishes to be competitive at Le Mans. The Corvette camp is viewing their poor performance at Laguna Seca as a learning opportunity ahead of Le Mans. They recently completed a pre-Le Mans test at the National Corvette Museum’s Motorsport Park in Bowling Green, Kentucky, where Magnussen says they “made some good headway,” and collected some crucial data ahead of the French endurance race in mid-June. Magnussen races in Denmark this weekend, and then it’ll be off to France for the Le Mans test day. Don’t forget to cheer Corvette Racing on during the 24 Hours of the Le Mans, and if you live in the Bowling Green area, you can watch the race alongside other Corvette fans at the National Corvette Museum’s viewing party.